As the number of holidays increased for Swedish workers in the 1930s, there was a subsequent demand for quality, reliable camping equipment. This is when Trangia - a then manufacturer of household pots - shifted their focus to cooking products made specifically for use in the outdoors. The first prototype outdoor stove was conceived in 1951, and the rest is history. Since then, the word ‘Trangia’ has become synonymous with quality, ingenuity and robustness. If you look at how the stove has evolved over the years, it’s clear to see that the bare-bones of its design has barely changed at all; simply developed and refined over time. The fact that it has undergone so few changes throughout its lifespan is a testament to just how well constructed the Trangia cook system is. As the old saying goes; if it ain’t broke, don’t fix it! 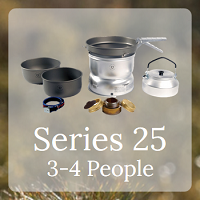 How does the Trangia Stove work? 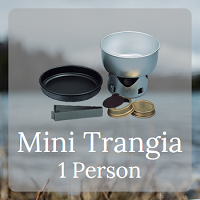 At the heart of the Trangia stove system is the two-part windshield. The ventilation holes in the lower windshield can be turned to face the wind, which helps to increase the oxygen supply to the burner. If the wind becomes too strong, simply turn the stove to maintain the required flallme. The combined frying pan/lid can be put on top of the pan to speed up heating and save fuel. The stove stands stable, with the pan on the supports recessed into the upper windshield, with the supports turned upwards when the frying pan is in use. When finished cooking, all the stoves moving parts fit neatly together into one compact package, meaning it’s lightweight and will take up minimal space in your rucksack. 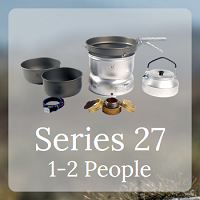 The Trangia Stove is recommended for use with Vango Gel Fuel and Vango Bio-ethanol Spirit Fuel, which are environmentally friendly alternatives to other cooking fuels on the market. 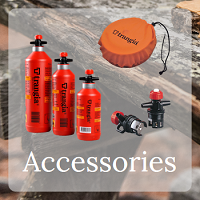 you can find out more about specific Trangia products and Vango Fuel below.